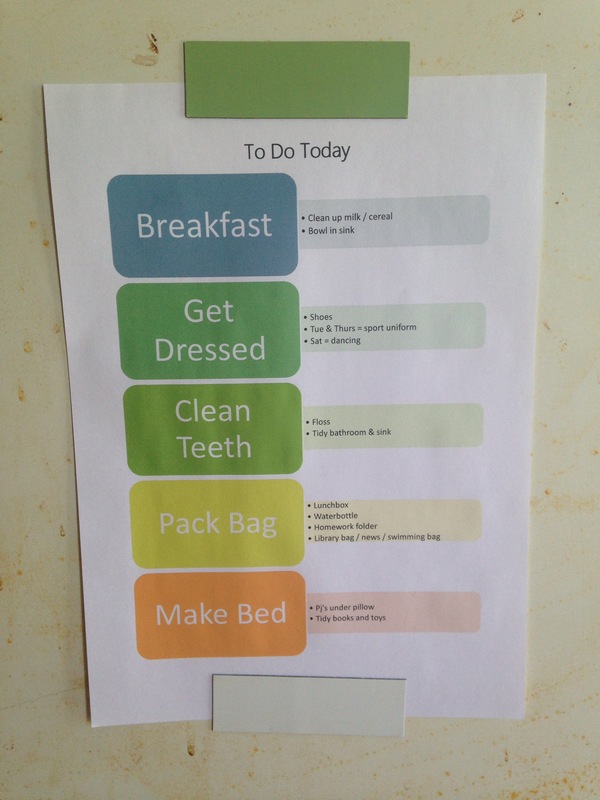 I’ve found this helps the kids and myself keep on track, and if there is ever anyone unfamiliar with our morning routine, this gives them a starting point. We have taught the boys that they need to put their school things in one spot when they get home from school. Everything has a home and the boys are responsible for making sure it gets there. This means in the morning, when we are rushing round it is easy to find everything they need. 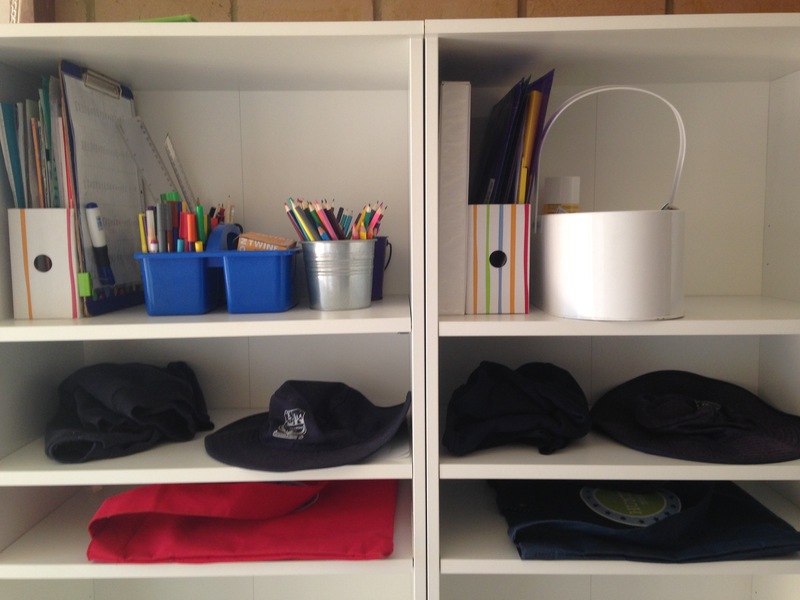 When we have swimming/ sports, or even if I am going away I will put their school uniforms out in their bag cubbies too- so they can get ready all in one spot and know exactly where everything is. Max is really, really good at taking 40 minutes to get just his jocks on. I don’t know what he is doing in his room between breakfast and rushing out the door, but he seems to spend an awful lot of time rolling on the floor. I’ve taken to setting a timer for each task, the boys have until that timer beeps (5 min for dressing, 3 for teeth cleaning etc) to get the task done and we agree on a consequence if it doesn’t get done in time- generally it means they have to do an extra job that afternoon before playtime. I have seen people color in their clock face marking out the different times their kids have to do their morning tasks, so the kids know by 7.20 they have 3 more minutes to get dressed, and at 7.30 they have 5 min to pack their bags etc. Making funny faces takes up a lot of time! I know this is probably a bit obvious, but if you have tired kids (and sometimes this is unavoidable) then everything is so much harder in the mornings. If you can get your kids into bed and asleep at a decent hour at night then they are more likely to be able to get up and get going in the morning with minimal fuss. 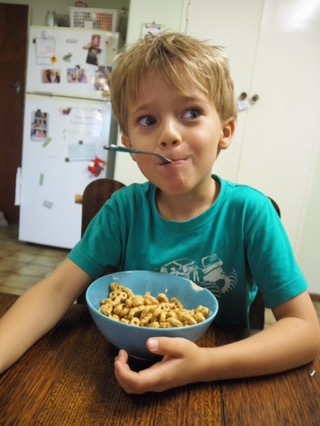 Hunter and Max are in grade 1 & 2 this year, and their bedtime is 7.30, though that is very flexible, if they are tired or difficult it becomes earlier! I find I don’t have to go and wake them up if they get to bed on time, they are usually up before me and hopefully having breakfast before I even get out of the shower! What do you do to get the kids organised and out the door on time?